This dark statement is meant to illustrate the desperate sense of lust inherent in ‘Scottie’ Ferguson during the scene. Scenes like this one have added fuel to many of the myths written about the portly director. People might take issue with my use of the word myth, but the fact remains that there are a lot of myths about the work of Alfred Hitchcock. In Truffaut’s famous interview with the director, Truffaut claimed that Pierre Boileau and Thomas Narcejac wrote ‘D’entre les morts’ especially for the director after learning of his interest in ‘Celle qui n’était plus.’ Henri-Georges Clouzot had purchased the property and turned it into Les Diaboliques (1955). Hitchcock was surprised by Truffaut’s claim, and denied that this was the case. Truffaut held firm. However, there is more evidence to suggest otherwise. Hitchcock was not the only one to deny this rumor. According to Narcejac, this sort of thing was quite common in Europe after WWII. It would take a lot of effort and a number of writers to adapt the Boileau-Narcejac novel into a usable screenplay. In this adaptation a number of important changes were made. The most obvious of these changes was the setting. The novel took place in Paris and spans from the early years of WWII to the liberation. This aspect was quickly jettisoned in favor of [then] modern day San Francisco. (Of course, names were also changed and Americanized.) These are only the most obvious changes. A comparison of the book and the film will show that only the basic plot remains. The book ends with the protagonist accidentally strangling the Madeleine/Renée character (Madeleine/Judy in the final film) after she finally confesses that she and the person he is trying to re-create is one and the same person. He then surrenders himself to the police, giving the dead Renée a tender kiss. 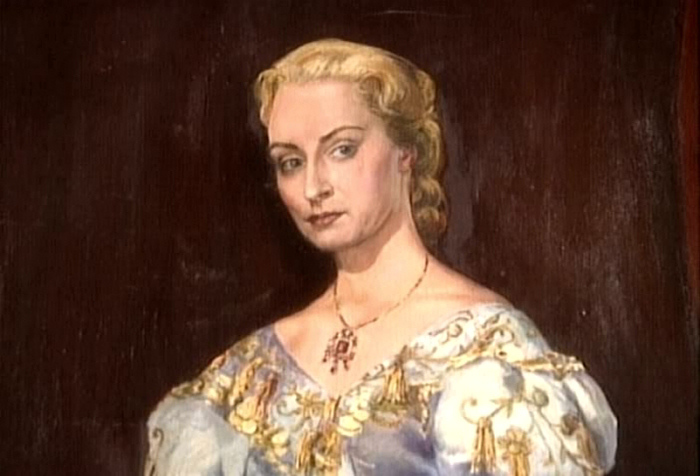 Hitchcock and his writers make the protagonist more proactive and intelligent by allowing him to figure out the murder plot after he sees Carlotta’s necklace. This also allows for visual storytelling and a “subjective treatment” of the material. Maxwell Anderson was the first writer to work on the film (without the benefit of Hitchcock’s help). Alfred Hitchcock was in Africa scouting locations for Flamingo Feather, a production that was abandoned shortly after the trip. When Anderson sent the director a rough draft titled ‘Darkling I Listen,’ it was found to be unusable. Some sources claim that it was incomprehensible, but it is more likely that it was simply not very interesting. 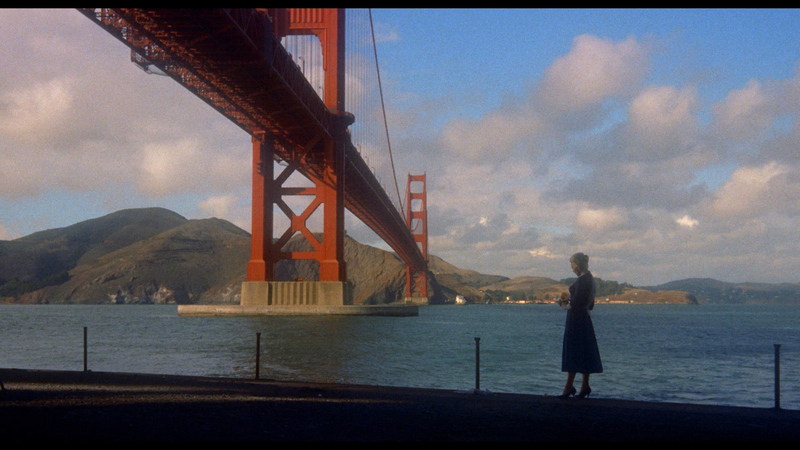 Very little of Anderson’s work is evident in the final film, although there are certain locations in this draft that were used in the final film (such as the Golden Gate Bridge and San Juan Bautista). After Angus MacPhail was unable to help the director work out a treatment, Hitchcock contacted Alec Coppel. On September 21, 1956 Coppel began working very closely with Hitchcock on the film’s construction. Alfred Hitchcock was not entirely happy with the outline as it stood, but did feel that the project was finally taking shape. On December 4th, the director would write a letter to Maxwell Anderson requesting that the writer take a look at Coppel’s work and flesh it out into a proper screenplay. The letter was quite long and very detailed. Anderson declined to work on the script and Alfred Hitchcock finally settled on Samuel Taylor, who would add character dimension to the outline and make several other changes before finally finishing the screenplay. 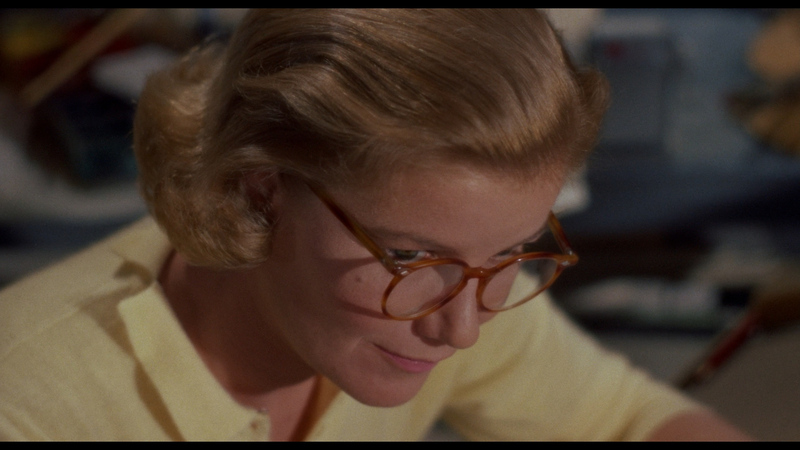 Taylor created the character of Midge (played by Barbara Bel Geddes) and began fleshing out the script with Hitchcock. There were times when Hitchcock’s health took him away from the project. The director underwent surgery twice. The first surgery was a hernia operation, and the second was due to complications with his gallbladder. When the director returned to the project, a significant change to the film’s construction was made. Up to this point, the murder conspiracy was not revealed until the very end of the film. With Taylor, Hitchcock decided to move this revelation earlier in the story. “ Now, in the book, they didn’t reveal that she was one and the same woman until the end of the story. I shocked Sam Taylor, who worked on it, when I said, ‘When Stewart comes upon this brunette girl, Sam, this is the time for us to blow the whole truth.’ He said, ‘Good God, why?’ I told him, if we don’t what is the rest of our story until we do reveal the truth. A man has picked up a brunette and sees in her the possibilities of resemblance to the other woman. Let’s put ourselves in the minds of our audience here: ‘So you’ve got a brunette and you’re going to change her.’ What story are we telling now? A man wants to make a girl over and then, at the very end, finds out it is the same woman. Maybe he kills her, or whatever. Here we are, back in our old situation: surprise or suspense… ‘ If we don’t let them know, they will speculate. They will get a very blurred impression as to what is going on. Taylor claims that this alteration was actually his idea. Whoever came up with the idea, Hitchcock was not completely confident about the decision. His doubts grew after the screenplay was finished. Taylor made a bid to have Coppel’s name removed from the screen credit and Coppel fought him (and rightly won). When Alec Coppel wrote the director about the dispute, the director’s doubt was solidified. “…I am conscious of the new dialogue and the new character Midge (who does not amount to anything) – but if Sam Taylor had started with only the book as his guide he couldn’t possibly have arrived at this latest script. Hitchcock’s uncertainty about the early reveal would last through the film’s post-production. In the late 1990s, Herbert Colman remembered Alfred Hitchcock’s reluctance to give away the murder conspiracy. …When he released the picture this way [without the confession], I had to call all the prints back that we had sent all over the country and re-cut the scene and redo the music and everything and send those out. In the meantime, Barney Balaban, the president of Paramount, who had seen the picture in its original form with the scene in, had gone back to New York and told everyone it was the greatest Hitchcock film. Just before the release date, between that time and the actual release date, Balaban, not knowing it was out, had a run-in with the critics in New York. They told him he was crazy – it was the worst Hitchcock film ever made. The early reveal of the plot’s ‘big secret’ has been the topic of debate, but this isn’t the most interesting aspect of this beautifully layered film. 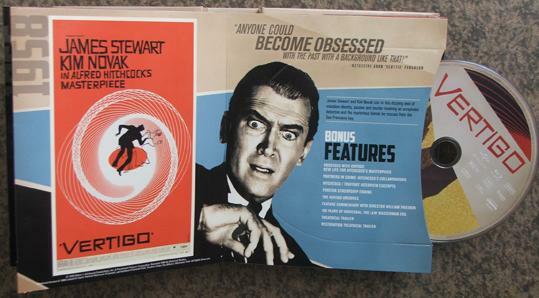 Actually, Vertigo is so rich in its thematic content that putting one’s hand on the ‘most interesting aspect’ of the film would be nearly impossible (and completely arguable). Of course, the film’s merits were not evident to everyone at the time. To the studio suits, the film was simply an incredibly convoluted murder mystery. Of course, sophisticated audiences know that the film is so much more than this. The production itself wasn’t entirely pleasant and there were a number of reasons for this. Alfred Hitchcock was never completely happy with Kim Novak, but this probably had much more to do with his personal temperament than with any disappointment with Novak’s performance. Disappointment coupled with an extreme dislike of confrontation colored his opinions. Alfred Hitchcock had originally cast someone else in the dual roles of Madeline and Judy. Alfred Hitchcock wasn’t happy about having spent money on costumes and production design that he would be unable to use. He also knew that he would have to alter his vision in order to continue with the project. However, one could certainly argue that Novak is a more appropriate casting choice, and that this stroke of bad luck was actually fortune smiling upon him. Of course, he may have never realized this. Novak was Paramount’s first choice. Some scholars even theorize that Hitchcock was already having second thoughts about casting Miles in the role before the actress became pregnant. This could very well be the case. 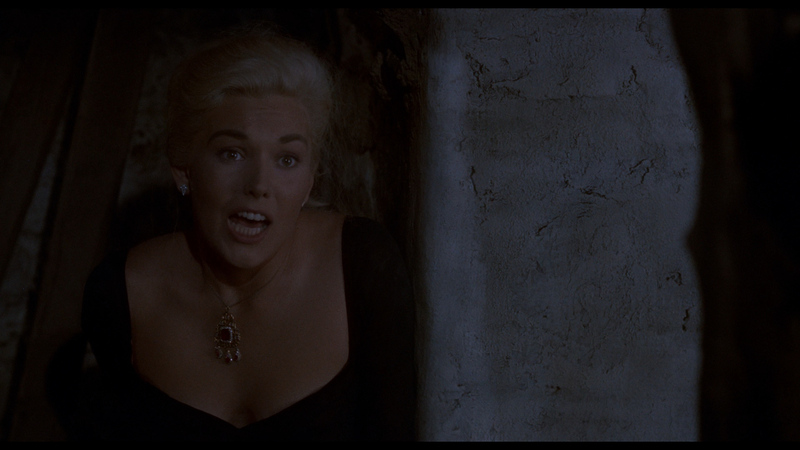 Kim Novak was under contract to Columbia at the time. This meant asking for a loan-out. Since none of the suits in Hollywood were crazy about the script, her loan-out was approved grudgingly (and with the stipulation that James Stewart would do a film for Columbia). “I was under contract to Columbia. Harry Cohn called me in one day and said, ‘I’m loaning you out. It’s a lousy script but it’s a great director. You’re going to go over to Paramount.’ I can’t remember what I was shooting just before, but anyway that’s how it came about. When Novak finished reading the script, she was pleasantly surprised. Life had prepared Novak for her participation in Vertigo. Galvin Elster’s treatment of Madeline, and Scotties treatment of Judy mirrored Cohn’s treatment of Novak. The conflict with Novak has been blown out of proportion, and most of it concerned the incredible costumes that were designed for the character of Madeline. Edith Head (who had designed the costumes) remembered the conflict, and wrote about it in her autobiography, Edith Head’s Hollywood. Hitchcock seemed to remember the event during his interview with François Truffaut, but he didn’t go into as much detail. 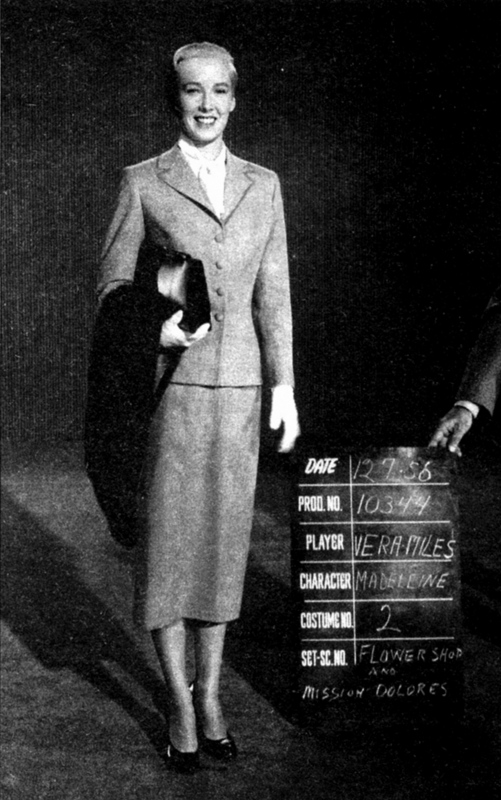 Madeline’s gray suit may have annoyed Novak, but the actress felt differently about Judy’s wardrobe. Hitchcock was also probably also annoyed that the actress delayed the production. This isn’t a stunt that would have appealed to Alfred Hitchcock. One of the reasons for his meticulous planning was to avoid inconveniences. Novak’s stunt likely worried the director a great deal. However, if Hitchcock was annoyed at Novak, he certainly never took it out on the actress during production. They simply did not associate with one another as friends. The working relationship between Novak and Hitchcock was not dissimilar from the director’s approach with other actors. 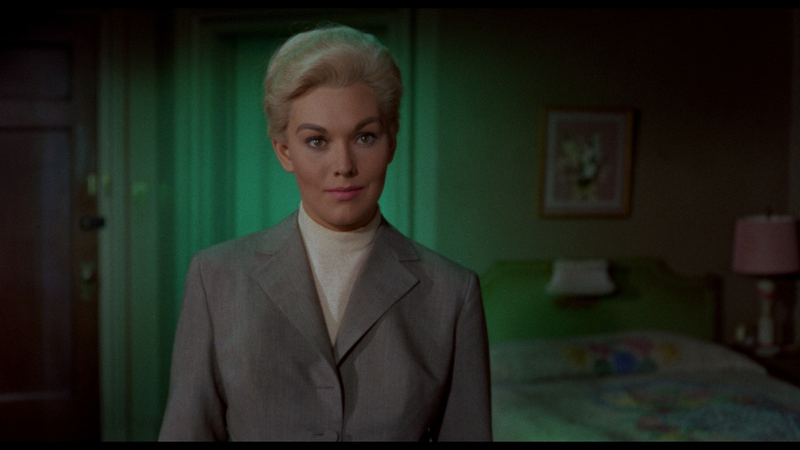 It has been written that Alfred Hitchcock tortured Kim Novak by shooting an exorbitant amount of takes. This particular myth is rather ridiculous and completely untrue. In a 1996 interview, Novak discussed her difficulty shooting the scene. The fact of the matter is that four takes is an extremely reasonable number for such a scene. One might even say that is a very considerate number. Luckily, most of the production challenges were creative in nature. These were challenges that Hitchcock relished. The famous ‘Vertigo effect’ is one case in point. 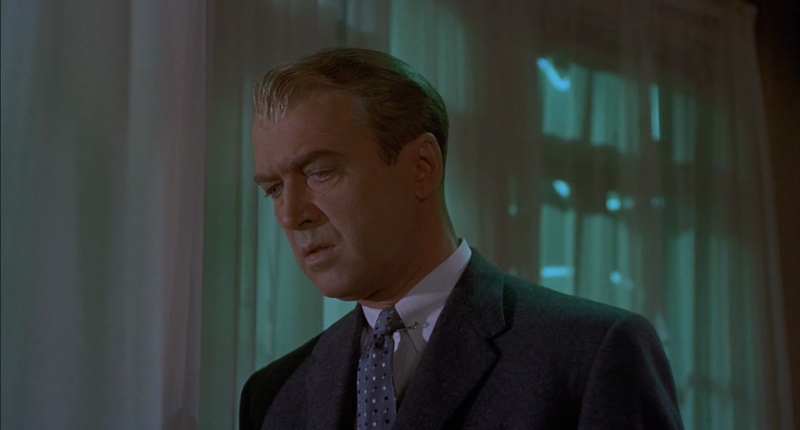 The director had wanted the effect in earlier films, but wasn’t able to achieve it until Vertigo. Today the effect is part of the cinematic language. 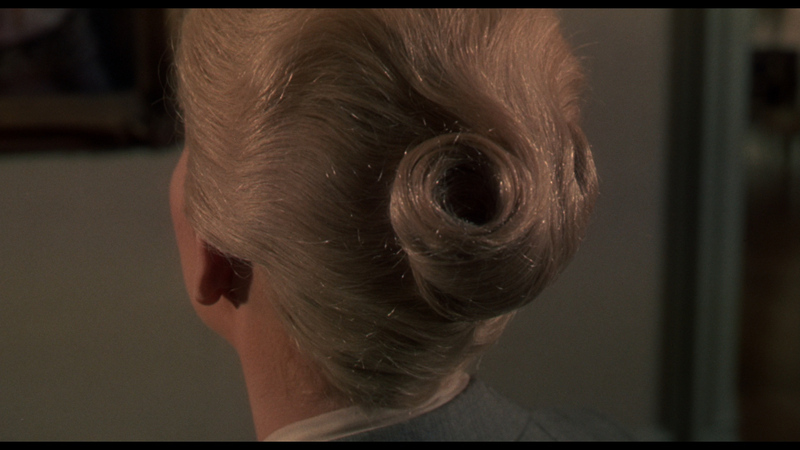 In Vertigo, the effect was not simply a gimmick. It allowed audiences to identify with Scottie. A lot of modern filmmakers forget that these effects should always have a purpose and attempt to elicit an emotional reaction in the audience. This is what Alfred Hitchcock did best. The scene where Judy is transformed back into Madeline in the hotel room is a perfect example of Hitchcock’s use of the visual to elicit an emotional reaction. This scene is almost visual poetry. The result is quite effective. Scottie not only prefers illusion to reality, he embraces illusion passionately. It seems that every element of the film adds richness and subtext to these themes. When one looks at the Saul Bass credit sequence (complete with animation designs by John Whitney), it is impossible not to think about the obsessive nature of Scottie’s character and the spirals inherent throughout Vertigo. 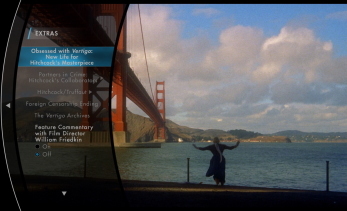 The visual design of Vertigo is as close to perfect as one could ever imagine. 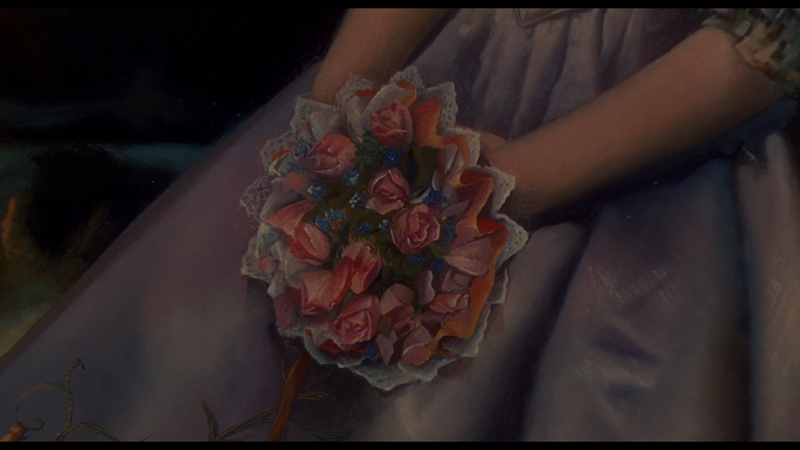 For easy illustration, just look at the spiral motif in the film. They are everywhere! Spirals are not limited to the most obvious examples of Madeline and Carlotta’s hairstyles, the bouquet of flowers, and the tower’s staircase. 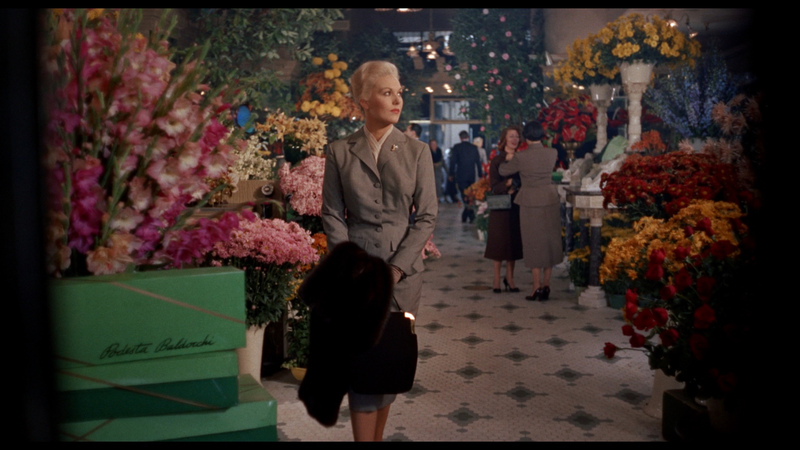 They are even evident in many of Hitchcock’s shot compositions (since many shots in Vertigo owe a debt to the golden ratio). Fibonacci would be proud! 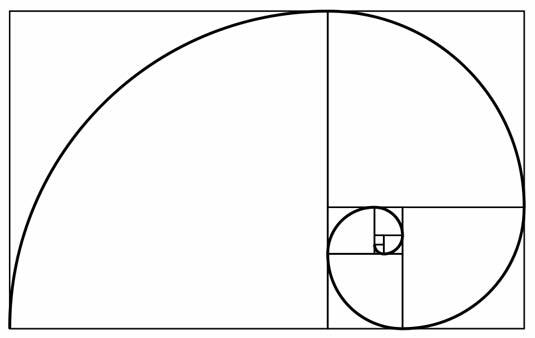 The structure of the story itself is a spiral. Scottie falls in love with a woman (who is actually another man’s construct) and loses her to death. He then falls in love with the same woman (turning her into this same construct) and once again loses her to death. People who complain about the film’s ending fail to understand the film itself. The abrupt nature of the ending is essential to the very design of the film! Bernard Herrmann’s brilliant score for the film also seems to have a spiraling sound and this contributes to the film’s effect on its audience. Of course, Herrmann never really held the film in high regard. However, Herrmann’s opinions are debatable. The San Francisco location seems to this reviewer preferable to New Orleans. New Orleans is perhaps a more obvious location, but San Francisco offers a haunting aura to the film that avoids the cliché described by Herrmann. What better setting could there be for an acrophobic character than San Francisco? Of course, the film’s merits were not always appreciated. The film was not an overwhelming critical or commercial success. Critical opinion seemed to cross the entire spectrum. A few critics raved about the film, other reviews were mixed with qualified praise, and some were rather hostile. Bosley Crowther wrote an overwhelmingly positive review for the New York Times. “You might say that Alfred Hitchcock’s latest mystery melodrama, Vertigo is all about how a dizzy fellow chases after a dizzy dame, the fellow being a ex-detective; and the dame being — well, you guess. That is as fair a thumbnail digest as we can hastily contrive to give you a gist of this picture without giving the secret away. And, believe us, that secret is so clever, even though it is devilishly far-fetched, that we wouldn’t want to risk at all disturbing your inevitable enjoyment of the film. … What is this thing that invades the moody person of his loved one, the wife of another man? And how can he free her from this demon — and from her husband? Second hint: This fascinating mystery is based upon a tale written by the same fellows, Pierre Boileau and Thomas Narcejac, who wrote the story from which was taken that excellent French mystery, “Diabolique.” That film, if you remember, told of a terribly devious plot to simulate a murder that didn’t happen. There! No more hints! Coming or not? The London Times also published a review that is quite positive, but terribly condescending. 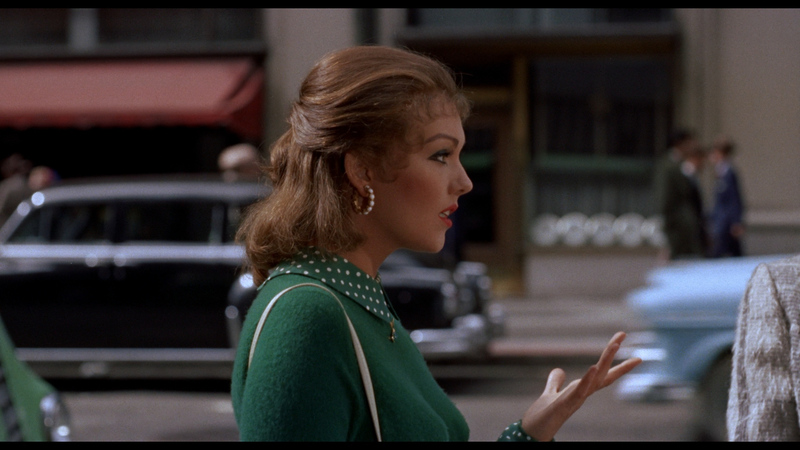 It underestimates the film completely and even goes as far as to complain about James Stewart and Kim Novak in their respective roles. 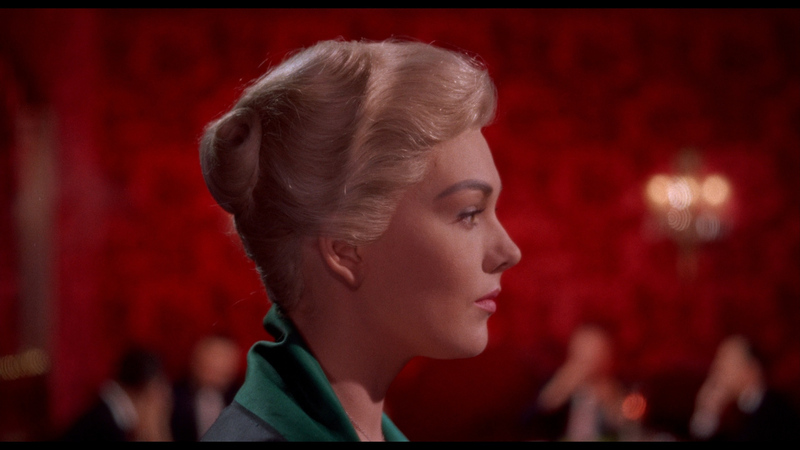 “Vertigo, which is now at the Odeon Cinema, Leicester Square, is not an important film or even major Hitchcock, but it entertains and is admirably photographed. Variety’s review was also rather mixed, offering only qualified praise. 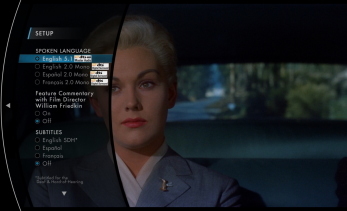 “Vertigo is prime though uneven Hitchcock and with the potent marquee combination of James Stewart and Kim Novak should prove to be a highly profitable enterprise at the box-office. Stewart, on camera almost constantly throughout the film’s 126 minutes, comes through with a startlingly fine performance as the lawyer-cop who suffers from acrophobia–that is, vertigo or dizziness in high places. Miss Novak, shop girl who involves Stewart in what turns out to be a clear case of murder, is interesting under Hitchcock’s direction and nearer an actress than she was in either Pal Joey or Jeanne Eagles. Unbilled, but certainly a prime factor in whatever success film may have, is the city of San Francisco, which has never been photographed so extensively and in such exquisite color as Robert Burks and his crew have here achieved. Through all of this runs Hitchcock’s directorial hand, cutting, angling and gimmicking with mastery. Unfortunately, even that mastery is not enough to overcome one major fault, for the plain fact is that the film’s first half is too slow and too long. This may be because: (1) Hitchcock became overly enamored with the vertiginous beauty of Frisco; or (2) the Alec Coppel-Samuel Taylor screenplay (from the novel ‘D’entre Les Morts’ by Pierre Boileau and Thomas Narcejac) just takes too long to get off the ground. Film opens with a rackling scene in which Stewart’s acrophobia is explained: he hangs from top of a building in midst of chasing a robber over rooftops and watches a police buddy plunge to his death. But for the next hour the action is mainly psychic…Film’s last minute, in which Stewart fights off acrophobia to drag Miss Novak to top of bell tower, finds she still loves him and then sees her totter and fall to her death through mortal fright of an approaching nun, is a spectacular scene, gorgeously conceived. …Frisco location scenes – whether of Nob Hill, interior of Ernie’s restaurant, Land’s End, downtown, Muir Woods, Mission Dolores or San Juan Bautista – are absolutely authentic and breathtaking. But these also tend to intrude on story line too heavily, giving a travelogueish effect at times. Of course, there were also critics that seemed to miss the point entirely. These individuals wrote scathing reviews of the film. The tone of these diatribes can be summed up in a single sentence from a review printed in Time magazine. In a 2014 interview, Kim Novak remembered these reviews the most. History has certainly been kind to Vertigo. Robin Wood’s 1965 essay about the film offers concrete proof that opinion can evolve over time. Donald Spoto was also generous in his praise for Vertigo, calling it “Alfred Hitchcock’s great masterpiece” in his book of essays about the director’s films. 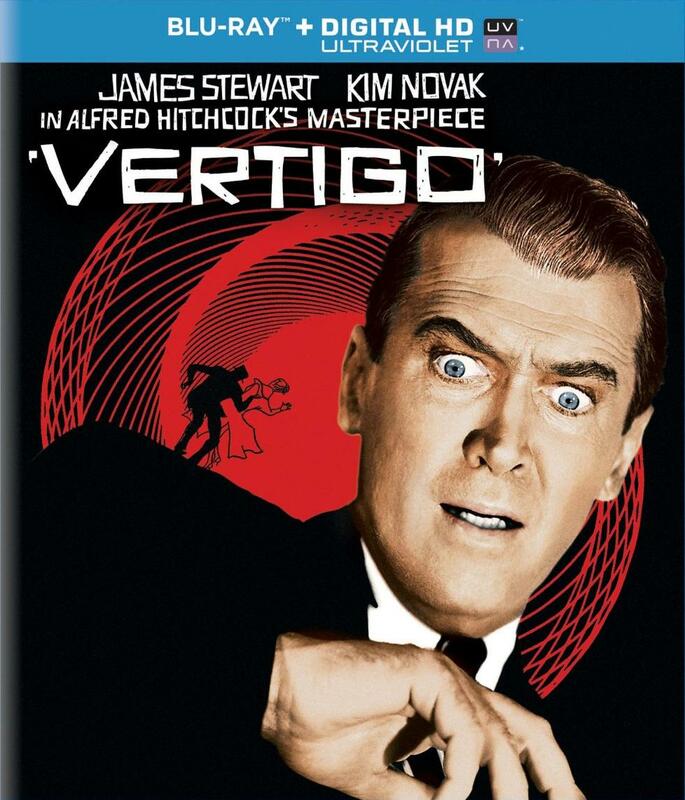 Perhaps the most important documented example of the film’s high esteem is the expensive restoration effort that Vertigo was given by James C Katz and Robert A. Harris. When this beautiful restoration was released theatrically in 1996, critics called the film a masterpiece. One such example is Janet Maslin’s review for the New York Times. Newsweek’s David Ansen was equally impressed. “When it was released in 1958, few people considered Vertigo Alfred Hitchcock’s best. Other Hitch movies were tauter, scarier, more on-the-surface fun. 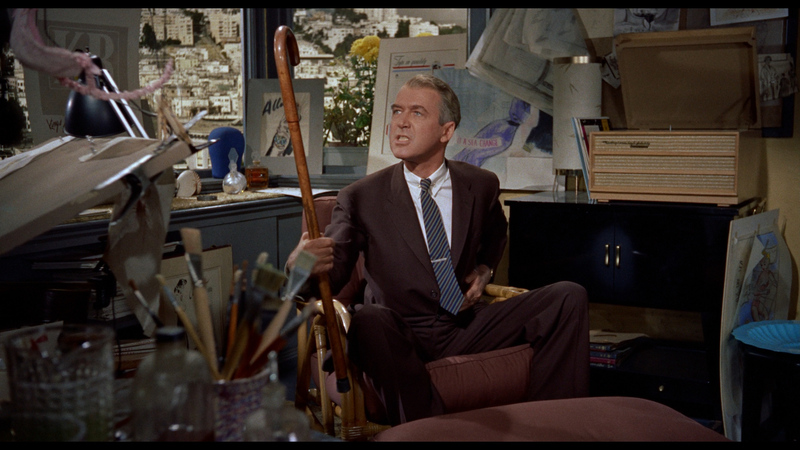 Vertigo needed time for the audience to rise to its darkly rapturous level. This month it reopens in a glorious 70mm print that’s been painstakingly restored by Robert A. Harris and James C. Katz. Now you can see Hitchcock’s greatest, most personal (and kinkiest) movie afresh, with a new digitalized soundtrack that brings Bernard Herrmann’s spiraling, haunted, ‘Tristan and Isolde’-infected score to the fore. Roger Ebert also praised the film in the Chicago Sun-Times. …Alfred Hitchcock took universal emotions, like fear, guilt and lust, placed them in ordinary characters, and developed them in images more than in words. His most frequent character, an innocent man wrongly accused, inspired much deeper identification than the superficial supermen in today’s action movies. He was a great visual stylist in two ways: He used obvious images and surrounded them with a subtle context. 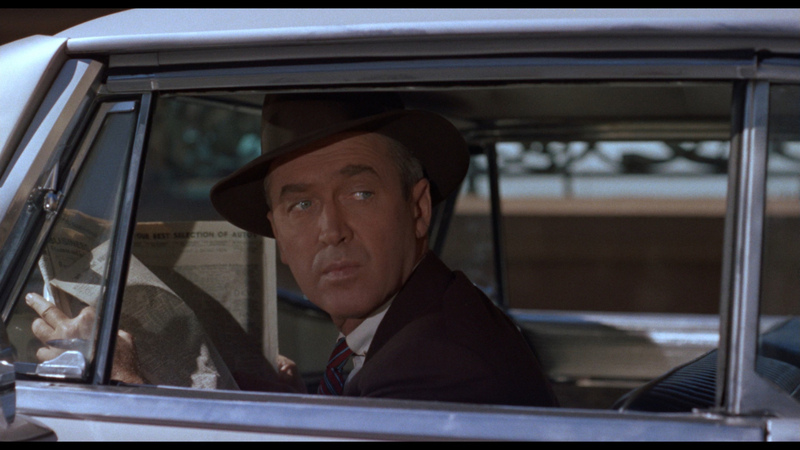 Consider the obvious ways he suggests James Stewart’s vertigo. An opening shot shows him teetering on a ladder, looking down at a street below. Flashbacks show why he left the police force. 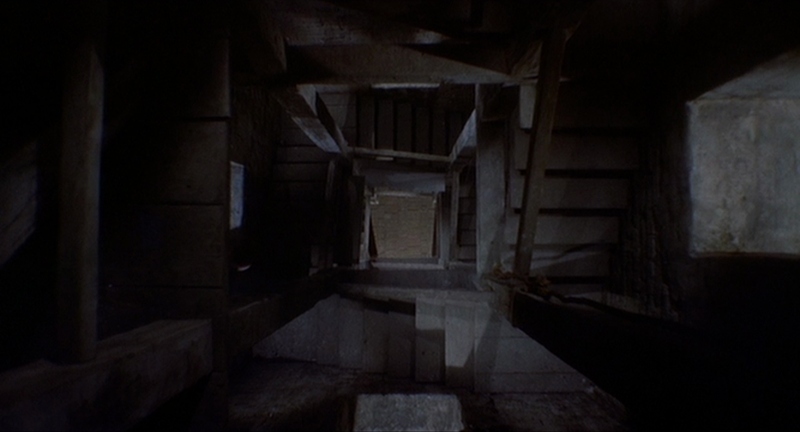 A bell tower at a mission terrifies him, and Hitchcock creates a famous shot to show his point of view: Using a model of the inside of the tower, and zooming the lens in while at the same time physically pulling the camera back, Hitchcock shows the walls approaching and receding at the same time; the space has the logic of a nightmare. But then notice less obvious ways that the movie sneaks in the concept of falling, as when Scottie drives down San Francisco’s hills, but never up. And note how truly he “falls” in love. 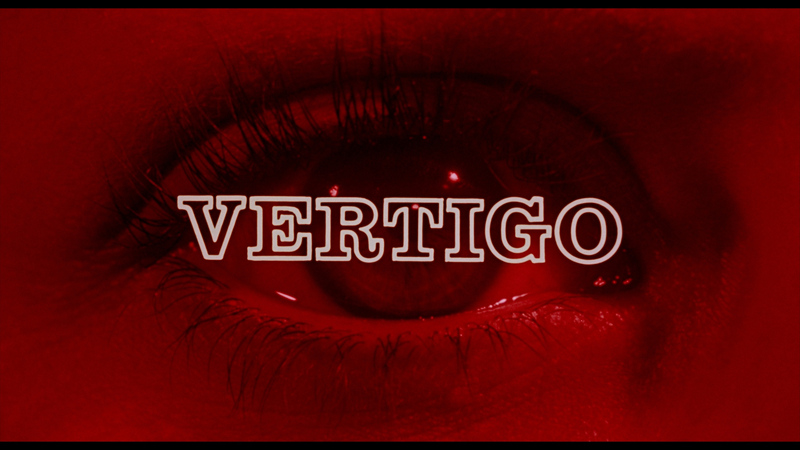 There is another element, rarely commented on, that makes Vertigo a great film. From the moment we are let in on the secret, the movie is equally about Judy: her pain, her loss, the trap she’s in. 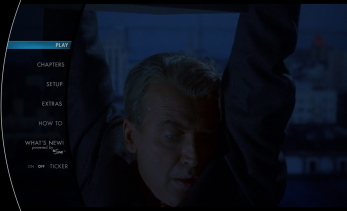 Hitchcock so cleverly manipulates the story that when the two characters climb up that mission tower, we identify with both of them, and fear for both of them, and in a way Judy is less guilty than Scottie. 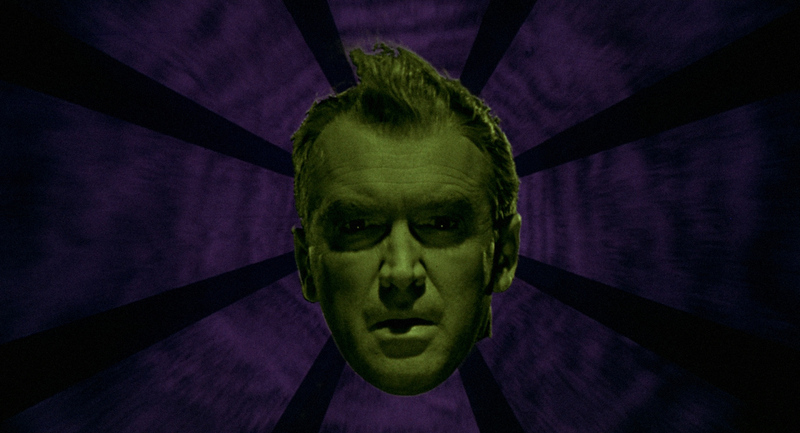 In 2012 critics and filmmakers would vote Vertigo as the #1 ‘Greatest Film of all Time’ in Sight and Sound‘s famous poll. 191 respected critics voted for the film, and 31 directors did likewise. This is perhaps the most obvious illustration of Vertigo’s growing appeal. The film is a rich and rewarding experience that changes over multiple viewings. The individual release presents the disc in a standard Blu-ray case with film related artwork (you can see the artwork on the top of this article). Universal’s 1080p transfer of the 1996 restoration print is impressive, but not perfect. Detail is wonderful and reveals textures and lines that weren’t as clearly defined on other home video releases. Clarity is wonderful, with only occasional digressions into slight softness. There is a fine layer of film grain, but this is a good thing. There aren’t any digital anomalies to annoy the viewer. Colors are quite wonderfully rendered (with only a few minor exceptions), and the picture exhibits appropriate contrast. There are moments when blacks feel slightly faded, but this never becomes a distraction. Any complaints one might have tend to be overwhelmed by the transfer’s more positive attributes. The DTS-HD Master Audio 5.1 mix wins the award for best soundtrack in Universal’s catalogue of Hitchcock films. The mix was rather controversial upon the release of the film’s wonderful restoration in 1996. Robert A. Harris and James C. Katz were forced to redo much of the soundtrack (based upon Alfred Hitchcock’s meticulous notes). Purists were quite upset. It is a marvelous job. Purists should be pleased to find that Universal has also included the films original mono track. The complaint here might be that it is not lossless. I suppose that one cannot have everything. It is certainly wonderful to see it included here in some form. If Universal had included the wonderful restoration commentary with Robert A. Harris and James C. Katz, this would be a near perfect collection of supplements. In its place, a featurette about the Lew Wasserman era of Universal is included. It does not amount to much. Fans will want to hold on to their DVD discs for this missing commentary track. One would probably rather have the Robert A. Harris and James C. Katz commentary included on this disc instead of this one. 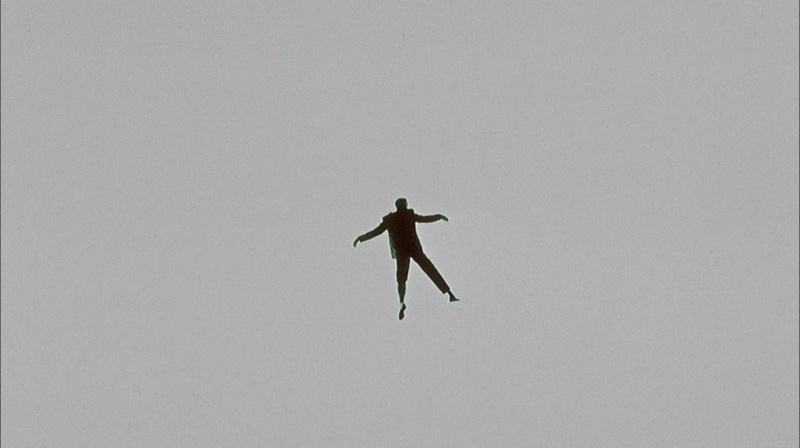 The track included various Vertigo participants (including Samuel Taylor) and was quite interesting. Friedkin offers an interesting enough track, but it is mostly a blow-by-blow of what is happening onscreen. One wonders why they asked him to provide a track for the film in the first place. He has made a few wonderful films, but he isn’t an expert on Vertigo. One might prefer Dan Auiler (who quite literally wrote the book on the making of Vertigo). This ‘original’ American Movie Classic documentary (produced when AMC actually aired classic movies) is narrated by Roddy McDowall and features a number of interviews with Vertigo participants (including Kim Novak, Barbara Bel Geddes, Herbert Coleman, and Patricia Hitchcock, and others). A significant portion of the documentary is dedicated to the wonderful 1996 restoration. Robert A. Harris and James C. Katz discuss (in reasonably comprehensive detail) what was involved in restoring this great classic. It is a wonderful documentary that is somewhat different to the documentaries on most of Universal’s Hitchcock releases (which were directed by Laurent Bouzereau). Some of the other documentaries were slightly more comprehensive (others weren’t). It is very nice to see this documentary included here. It is one of the two best supplements on this disc. This documentary has four chapters. These chapters include; Saul Bass: Title Champ, Edith Head: Dressing the Master’s Movies, Bernard Herrmann: Hitchcock’s Maestro, and Alma: The Master’s Muse. Each of these chapters is informative and entertaining. They are exceptional additions to this disc. This is an ending that was tagged on to the film for its foreign release, and was probably never intended to be the film’s proper ending (though it was included in the shooting script). It is incredibly interesting and one of the most welcome additions to the disc. This featurette about Universal Studios during Lew Wasserman’s reign is an appropriate extra for a Hitchcock film (and even includes a clip of Alfred Hitchcock promoting the Universal tour). It certainly isn’t the best supplement here, but it is welcome. The ‘Original’ Theatrical Trailer was created with the intention of making the audience understand the meaning of the film’s title, while also exploiting the more sensational aspects of the film. It is an interesting artifact and fans should be grateful to have it included here. The 1996 Restoration Re-release trailer is included and is a welcome addition to the disc. ‘The Vertigo Archives’ is essentially am extensive photo gallery that includes production photographs, stills, posters, advertisements, and production design drawings. Many of these are quite interesting. 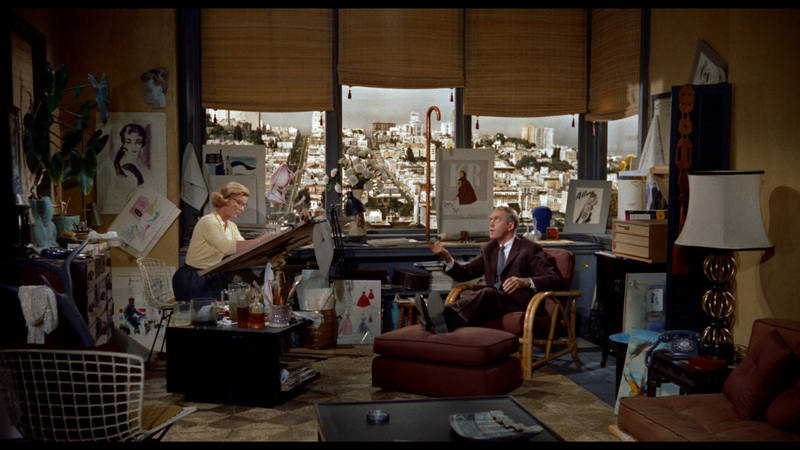 Vertigo is a brilliant work that demands to be revisited. Universal’s transfer of the film’s 1996 restoration is not perfect, but it is quite good and improves upon previous releases. Do yourself a favor and take the plunge. 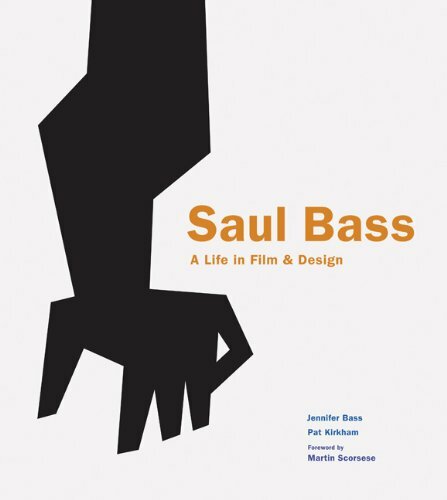 Saul Bass: A Life in Film & Design is the first book dedicated to one of the greatest American designers of the 20th century. Saul Bass created some of the most compelling images of American postwar visual culture. Having extended the remit of graphic design to include film titles, he went on to transform the genre. His best-known works include a series of unforgettable posters and title sequences for films such as Alfred Hitchcock’s Vertigo, North by Northwest, and Psycho. His work for other directors was equally iconic and will remain cemented in pop culture history. Bass also created many recognizable logos and corporate identity campaigns, including those for AT&T, Quaker Oats, United Airlines, Girl Scouts of America, and Minolta. His wife and collaborator, Elaine, joined the Bass office in the late 1950s. Together they created an impressive series of award-winning short films, as well as an equally impressive series of film titles, ranging from Stanley Kubrick’s Spartacus in the early 1960s to Martin Scorsese’s Cape Fear and Casino in the 1990s. The book was designed by Saul Bass’s daughter, Jennifer, and written by distinguished design historian, Pat Kirkham (who knew Saul Bass personally). It contains 440 pages of information and graphic art. One shouldn’t expect the book to serve as a traditional biography. Instead, it serves as a visual study of Saul Bass’s eclectic oeuvre. A lot of the contextual information is provided using extended quotes from Saul Bass and many of the people that worked with him. This gives the book an autobiographical flavor. Like an autobiography, one must be on guard for false information. Bass’s claim that he directed the shower scene in Psycho is repeated here, even though this has been proven untrue. (He drew the storyboards.) He also refers to Kim Novak’s character in Vertigo as “Julie” instead of “Judy.” I suspect that there were other issues along these lines, but none of these issues decrease the book’s enormous value. This value lies in the book’s numerous illustrations. It could have been titled “Eye Candy.” Readers are given a glimpse at a great many graphic designs, and over half of the book focuses on his film posters and title sequences. For this reason, it is nearly impossible to put down. Saul Bass: A Life in Film & Design increased both my respect and my understanding of Saul Bass’s output. Note: This title is also available on a 2-disc 50th Anniversary DVD set. Alfred Hitchcock’s 1959 ‘fantasy’ is a thrill from beginning to end. It is the director’s longest film (136 minutes), but one doesn’t feel the time pass. 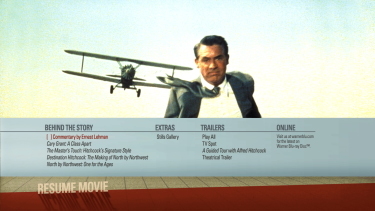 North by Northwest is every bit as enjoyable today as it was 54 years ago. It continues to attract admiration from audiences and many people consider it to be Hitchcock’s best film. 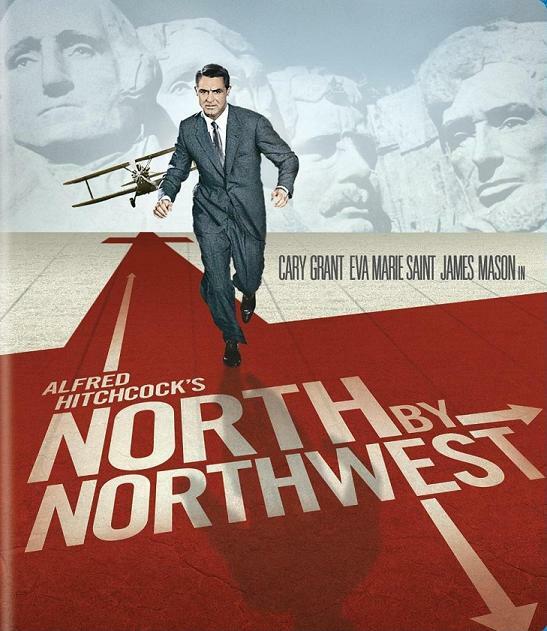 This is debatable, but it must be said that North by Northwest is certainly one of his most enjoyable efforts. AFI continues to include it in many of their “best” lists and its legacy does not seem to be fading. Warner Brothers offers two different releases for this particular disc and the difference in these releases lie solely in their packaging. The normal Blu-ray release packages the disc in the standard blue plastic case. The 50th Anniversary Edition packages the disk in an attractive Blu-ray book format. This special edition has an extremely classy presentation and is priced at an estimated ten dollars higher than the regular release. It is slightly skimpy in actual content, but one must admit that its 44 pages are beautifully rendered. 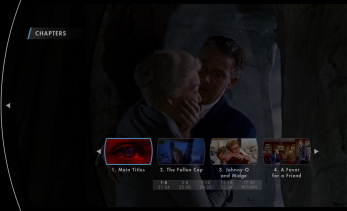 The film begins playing when the disc is put into the player, but Warner Brothers does offer a menu that can be accessed at any time. The menu itself is rather soft and grainy and does not hint at the quality of the actual film’s visual presentation on the disc. It might not be possible to adequately put into words just how amazing this 8K restoration transfer looks in high definition. Warner Brothers should be proud of this release and Hitchcock fans and anyone else who has a love for classic cinema should feel lucky to own it. The level of detail in this high definition transfer is truly astonishing. This film looks better than a few of the transfers of more recent films I have seen. The studio spared no expense on bringing us a fantastic picture. The picture is presented in an aspect ratio of 1.78:1 and is actually closer to the original 1.66:1 VistaVision ratio than the film’s original DVD release. The color on this transfer seems richer and more cinematic. I would imagine that this is very similar to how the image looked in the cinemas. There seems to be absolutely no print damage. 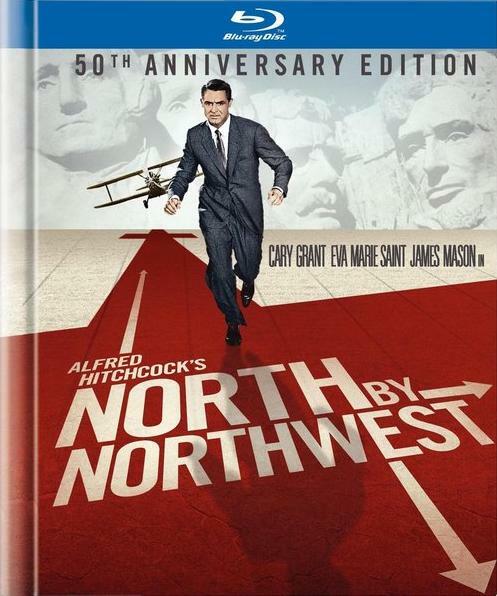 This might not be quite as sharp as a more recent film, but I can assure you that North by Northwest has never looked sharper than it does in this release. Even more amazingly, this seems to have been achieved without the use of any artificial edge enhancement. 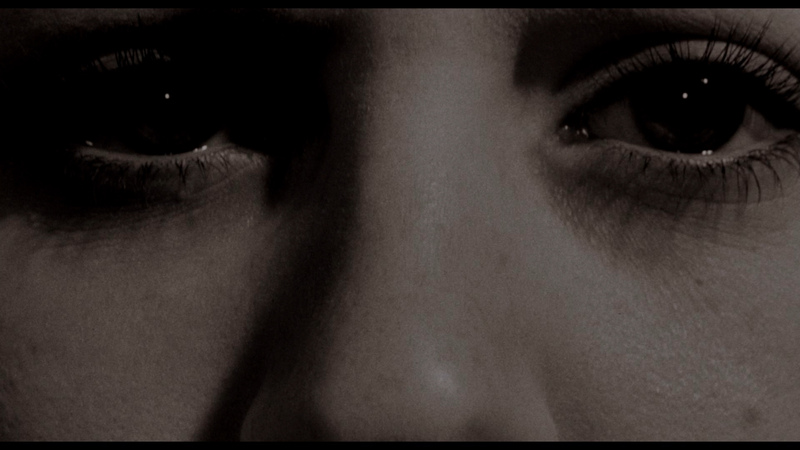 There is an appropriate amount of grain for a film of this era, but it is an extremely clean image. It is simply gorgeous. Purists might find fault with the sound options on this release. 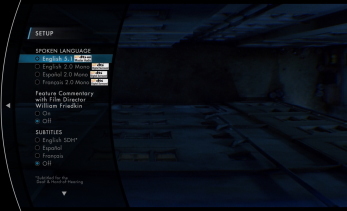 A TrueHD 5.1 audio mix has been created for this release and the disc does not seem to contain its original soundtrack. It is unfortunate that this track is not included in addition to this new 5.1 high definition mix, but I have no complaints about this new mix. It is a modest remix that retains the essence of the original soundtrack. It is mixed at a low volume and it might become necessary to raise the volume on your television set, but it is a very nice experience. Dialogue is consistently clear and well prioritized. It is delivered mainly through the center channels but has presence in the left and right speakers as well. Bernard Herrmann’s fabulous score has never sounded better than it is presented here and there are some wonderful panning effects during the crop dusting sequence that enhance the viewing experience without going overboard. This is a subtle mix that suits the film nicely. Warner Brothers offers a rather fabulous selection of special features. Even contemporary films rarely receive so many excellent features on home video. Many of these selections might have been preferable in high definition and included on a second disc (although a few of these features are likely from standard definition sources). However, this is only a small complaint. This is an extremely interesting commentary by screenwriter Ernest Lehman. It is slightly slow getting started, but it contains a wealth of information that fans of the film will consider priceless. Some of the most fascinating moments of the commentary have less to do with factual information and a bit more to do with ego and conceit. There are moments in the film where the writer seems almost bitter that he has not received more credit for the film’s success. This was recorded for original DVD release years ago and anyone who owns any of the DVD versions of the film will have heard it already. This feature is essential for anyone who would like to experience Herrmann’s score for North by Northwest without the distraction of other elements of the soundtrack. It illuminates Herrmann’s profound contribution to the film perfectly. This track is a carry over from the original DVD release of the film. This is a wonderful “Making of” documentary hosted by Eva Marie Saint. It is fairly comprehensive and always interesting. This feature is another carry over from the film’s original DVD release. Contemporary directors and scholars discuss North by Northwest giving their impressions of the film along with a few details about production and where the film fits into the Hitchcock canon as a whole. This is the weakest of the documentaries on the disc, but it is consistently enjoyable and interesting. This documentary utilizes interesting footage from a documentary made in the 1970s of Hitchcock himself discussing his methods. Even better, we see a few behind the scenes moments of the director shooting “Blackmail.” Contemporary directors also appear to discuss Hitchcock’s style and technique as film clips illustrate what the participants are saying. It is an interesting addition to the disc. This feature length documentary on Cary Grant is surprisingly wonderful and fairly comprehensive. It does not ignore some of the more controversial aspects of Grant’s life (although it has a tendency to play them down) and it discusses his career in more detail than some of the other documentaries available about the actor. It is consistently interesting and a welcome addition to this release. Many are likely to prefer this feature over all of the others on the disc. This is an interesting promotional trailer featuring Alfred Hitchcock himself. Vintage trailers are usually interesting and this one is no exception. However, the trailer featuring Hitchcock is superior. This is a black and white television spot for the film. It is quite like the theatrical trailer for the film. A collection of stills and behind the scenes photos from the film. 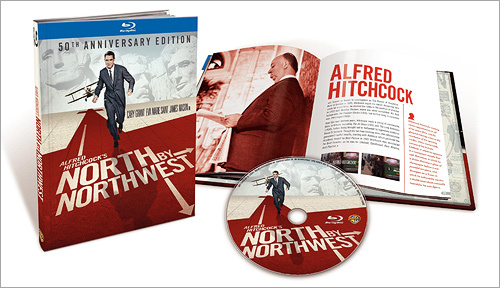 It also includes additional photos from the shooting of Destination Hitchcock: The Making of North by Northwest. This book is beautifully presented and I admire the presentation. The photos are wonderful, even if the information and short biographies included in the book tend to not offer a lot of new information. Warner Brothers has provided Hitchcock fans with an amazing Blu-ray release of profound quality and substance. The 8K restoration and transfer is truly beautiful. This disk is essential.